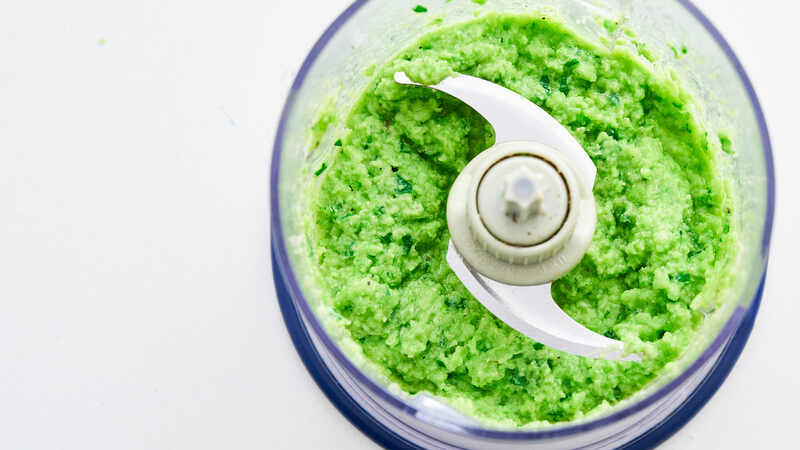 With fresh green peas, cheese, and olive oil, this flavorful Green Pea Pesto (Pesto di Piselli) works as a dip, a spread, and a sauce to add a splash of spring to almost any dish. If I’m being perfectly honest, I can’t say I’ve ever been too fond of green peas. Undercook them, and the membranes holding the peas together, tend to be tough and leave little bits of popcorn-like skin in your mouth. Overcook them, and they turn a drab green taking on a funky smell. 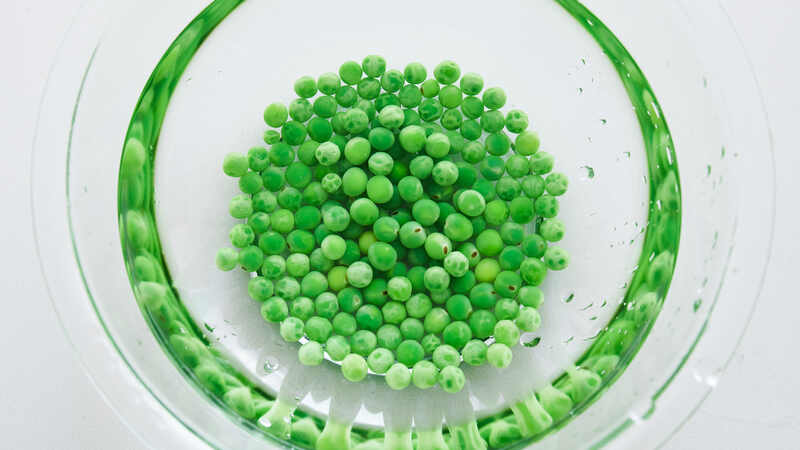 But if you leave texture aside, I love the taste of green peas. At their best, they are sweet and creamy with just a hint of verdant bitterness. Moreover, the arrival of these pregnant pods at the market symbolizes all the rejuvenated newness of spring. As winter thaws and the warm weather brings on a blizzard of cherry blossoms. I can never resist the allure of these pastel green pods. I usually end up blanching them and sauteeing them with other spring vegetables, or pureeing them into soup, but this year I was persuaded into my purchase by a friendly vendor at Tsukiji market who suggested I make pesto. The food processor eliminates the texture issue, which means you can boil them for less time, preserving their vibrant color. The Parmigiano-Reggiano strikes a synergy with the amino-acid-rich peas resulting in a pesto that’s brimming with umami. But perhaps the best part is the versatility of this condiment. It makes for a delicious dip for bread, a sublime spread for sandwiches, and is perfect, paired with pasta. 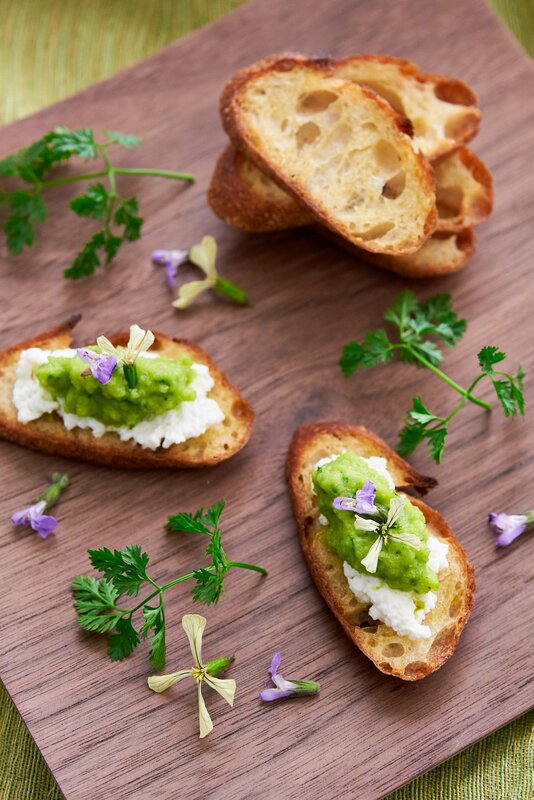 For the photos accompanying this post, I’ve just toasted some thinly sliced baguette brushed with olive oil and topped them with a schmear of fresh ricotta and a dollop of pea pesto. Sage and arugula blossoms add a splash of color and peppery bite, but chopped herbs such as parsley, basil, or chervil would work just as well. Other ideas I’ve had for this pea pesto are to serve it under slices of crisp skinned-roast chicken, or to mix it into mashed potatoes. I think this would also be pretty amazing in an omelet or swirled into scrambled eggs. Shell the peas. Prepare a large bowl of ice water, and bring a large pot of salted water (should taste like the sea) to a boil. 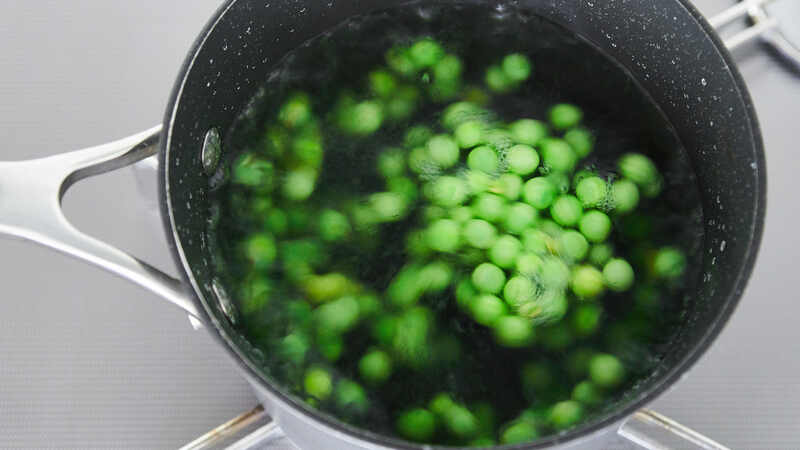 Boil the shelled peas until tender, but still vibrant green (2-3 minutes). It's okay if the skins are still a bit tough, just make sure the centers have softened. When the peas are almost done, add the scallions and blanch for 15 seconds. Drain and plunge into the ice bath. One chilled drain the peas very well. Squeeze the scallions to remove excess moisture. 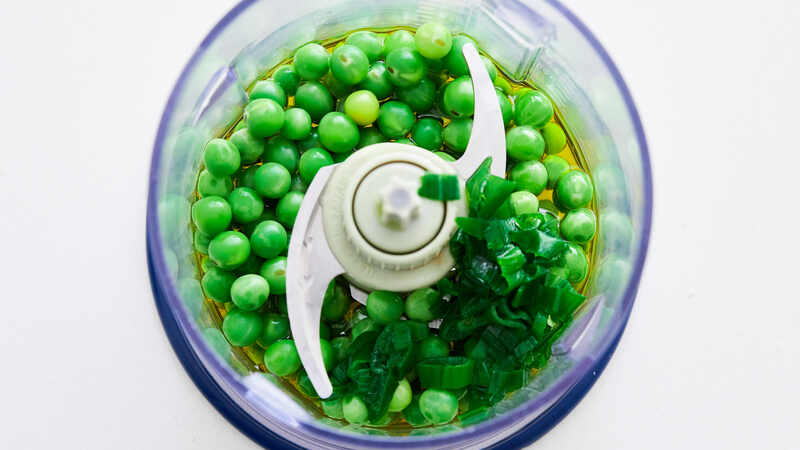 Chop the scallions and add them to a small food processor along with the peas, Parmigiano-Reggiano, olive oil, honey, salt and black pepper. Process the pesto until the peas are finely chopped, but not so long that the pesto is fully pureed. 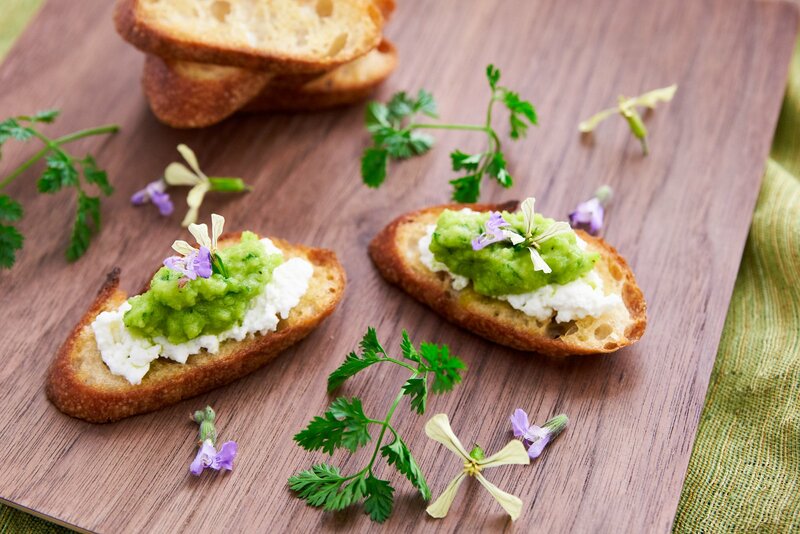 Serve the green pea pesto with crostini or crackers.